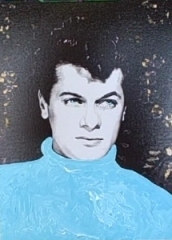 Legendary actor Tony Curtis has been painting and creating art since the early 1960s. According to his website, "His work can command more than $50,000 a canvas now and it is on this he now focuses rather than movies." Tony Curtis will present his artwork and make a special appearance at Art Couture Gallery in Dallas, Texas on March 27 & March 28, 2009. According to the gallery, Curtis will be debuting "a new series of mixed media pieces that meld nostalgic movie sets photographs with paint." The image posted here is one of these mixed media pieces, titled "Johnny Dark", from Tony Curtis' 1954 movie of the same name. The event will include receptions with Mr. Curtis on both Friday and Saturday. For $100 per person, guests may also join the artist for dinner at a nearby restaurant immediately following the event. A portion of the evening’s proceeds will be donated to the Texas Scottish Rite Hospital. Contact the gallery for more information. 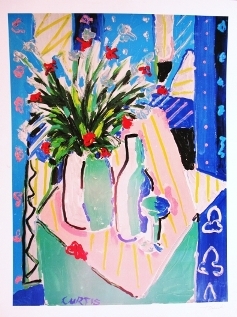 Visit Tony Curtis' Official Website for more information about his artwork. See the Pop Life Art home page for links to the artwork of Tony Curtis and more than 100 other celebrity artists.